A multi-millionaire, Kenny Lai, has invested in a number of Tibetan mastiffs which are the most expensive dog breed in the world. He bought a £3.2 million collection of dogs three years ago and has now bred his collection so it is now worth around £8 million. Me love you Hong Dong – 1.5 million dollah! A red Tibetan Mastiff pup has entered the record books by becoming the world’s most expensive dog. Hong Dong – or ‘Big Splash’ in English – is just under a year old but already tips the scales at over 180lbs and is three feet high from shoulder to ground. The hefty pup also sports a bright red coat. One dog rule for Shanghai? 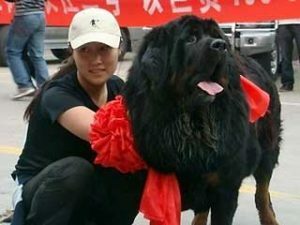 This month, a Tibetan mastiff may well have broken the world record for being the world’s most expensive dog when a Chinese lady known only by the surname of Wang bought the dog for a figure reported to be 4 million yuan (£350,000). The prize dog is called Yangtze River Number Two, is 18 months old and stands 31 inches (80 cm) tall. Apparently, a parade of 30 cars were sent to the airport in Shaanxi to collect Yangtze and a crowd gathered to meet him.